In global, Tranzistow (this is not a mistake - it is not "Transistow") is a virtual software synthesizer with 4 or 8 independent multi parts. Although it is (to some extent) inspired by Waldorf Q, Waldorf Microwave II/XT, Alesis Andromeda, Oberheim Xpander, John Bowen Solaris and Yamaha DX series, it has a unique sound and tons of unique features not found on any other synthesizer. 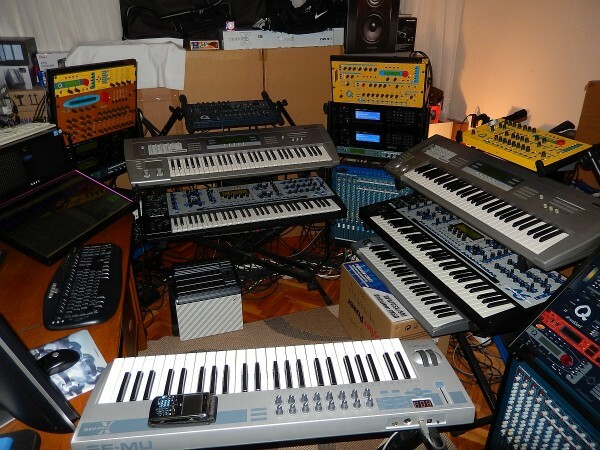 Various forms of synthesis are supported including Additive, Virtual Analog/Modeling (VA), Wavetable (with classic, crossfade and full wave interpolation modes), two completely independent FM engines, Ring Modulation, Oscillator Sync, Vectors, Rotors (as in Solaris), various filter models (SVF 12/24dB, 6dB to 24dB Transistor Ladder with fully configurable poles, 24dB Diode LowPass Ladder, ...), Filter Chaining, Comb Filters, WaveShaping, freely drawable Contour Generators, exhaustive FX section including Chorus/Flanger, Phaser, Delay and Reverb units, etc, etc. I developed Tranzistow for myself in the first place. My goal was not to (try to) emulate existing (hardware or software, analog or digital) synthesizers (although I was inspired by some of them) but to create something I can actually use in my own music, to master DSP/Assembler/Vector/SSE/GPU/OpenCL programming, to refresh my mathematics knowledge and, last but not least - to have fun. As a result, the synthesizer is mostly unconventional, some features (which most users take for granted) could be missing or could look rather strange, user interface may not be everybody's cup of tea because it was designed according to my habits/needs, etc. (*) No multimode and no multiprocessing - it is monotimbral, singlethreaded and only Part #1 with 16 voices of polyphony is available. External Control Interface is disabled as well. (*) It loads the default patch on every start, so you'll have to manually reload all patches every time you open/reload a particular project. (*) No ability to process external inputs through Tranzistow FX units, so it cannot be used as a standalone FX processor. External inputs can still be processed through the voice engine, though. (*) Occassional noise and clicks/pops now and then, together with occassional missed notes. This is just a slight annoyance which won't have a big impact on the sound and won't disturb the "demonstration purpose" of the synthesizer, but will prevent its serious usage because you don't want to have clicks/pops and missed notes in your tracks, do you? Quite a few of EDT patches are using sample engine (mostly in "LA Style") which I didn't even touch in my own patches. BTW, is it that just links are not working or the whole http://hrastprogrammer.com website is not accessible? What OS/version and browser/version do you use? Latest version of Firefox, IE and Chrome. None of them work. Dont know if it has anything to do with it .. when I do a manual DNS lookup on the hrastprogrammer.com domain and then plug in the IP address into the brower it complains about CGI not being set up correctly. Going into it trough the domain name works fine here though. Anyway, this could just be a website design decision, but had never seen it work like that. This is probably OK because I don't have a dedicated server with my own IP address - so this address is shared by all webpages on the server. It would be great to have a dedicated server with own IP address but this is way too expensive for me. CoolColJ ... Are you able connect to http://hrastprogrammer.com/index.htm through a proxy? perhaps my ISP is blocking it? Hrast, I LOVE your music, but there isn't any .exe .com or .bat file to run your synthesizer! I admit, my mental image of most of your lovely music is of you sitting in front of a Moog that Zimmer would be envious of and twisting the hell out of two dozen 960 sequencers. How do you run this? All of my previous experience is with my modular where you plug 3.5mm cables into it. Thanks for the IP address. 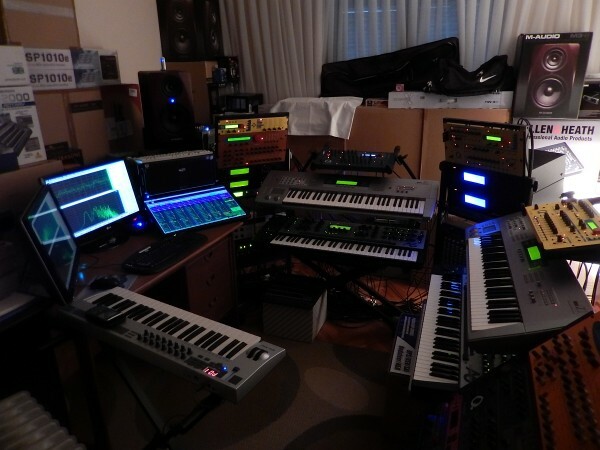 My music is not made on Tranzistow only - Tranzistow is just one (although very important) part of the whole setup which consists of dozen of hardware synthesizers, two powerful computers, various audio interfaces, hardware mixers, my own software sequencer, etc. On the "Osc/Main" page there are "Osc", "AuxOsc" and "Modules" sections where you can turn sound generators and other modules on/off. "Init" patch has "Saw/Wave" set for "AuxOsc" module + FilterB module turned on, so it produces a simple saw wave(s) by auxiliary oscillator(s) which then go through a 24dB ladder filter(s). If you want pulse/triangle then choose "Saw/Wave+Pulse/Ramp" for "AuxOsc" module, go to "Osc/Aux" page and set "SawLevel", "PulseLevel" and "RampLevel" accordingly (for some "historical" reasons, triangle is incorrectly reffered as "ramp" in TW). Or just leave it at "Saw/Wave" and set "SawSigma2" to -1 for pulse, then set "SawShape" to the max for triangle. As there are 4 oscillators in parallel inside a single oscillator module, you can set all those parameters individually for each oscillator. If you want a sine wave(s) then either set "AuxOsc" module to "Sine/Wave" or set "Morph" parameter down to zero for a particular oscillator. Main oscillators ("Osc/Main" page and "Osc" parameter) are similar to auxiliary ones. If you choose "Analog Model" or "Digital Model" for the "Waveform" of a particular oscillator then it works more-or-less as described above (although the sound generation algorithm is totally different because those models are based on additive synthesis). You can also set the "Waveform" to various wavetables for wavetable synthesis etc. (1) It makes editing on the touch screen a breeze. (2) It makes editing with Behringer BCR2000 controller a breeze (not available in demo version). (3) I am always thinking about turning it into a hardware synthesizer of some sort - such parameter layout would work perfectly with minimum amount of knobs and small LCD displays (like the one on Waldorf Microwave II, for example). Yes, I am aware of this but, as I said, it is my personal project and I developed it for myself in the first place - it serves me perfectly and it is much more easy for me to use Tranzistow than any other synth out there. Scale parameter is in percents and the default is 100 (meaning the original 100% scale). The user interface is optimized for 1280x720, 1280x768 and 1280x800 resolutions so the alignment of various elements can be slightly different with scales other than 100. Wow, this looks great! I will definitely give it a try.